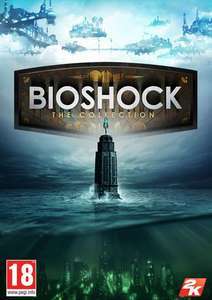 This collection contains all three remastered Bioshock games and their DLC. EDIT: I have just input the key into my steam account and it seems that the pack contains all three original games AND all of the remastered versions too with the remastered DLC included. Steam price is still at £39.99 and even individually the remastered versions of these games are £9.99, if this isn't a bargain then I don't know what is! Just a word of warning though, the remastered version of the second game is an utter shambles on PC, crashes all over the shop. Theoriginal version of the sequel isn't without its problems either. Its a great shame as its a highly underated game that's well worth a play through. Great price!Just a word of warning though, the remastered version of the …Great price!Just a word of warning though, the remastered version of the second game is an utter shambles on PC, crashes all over the shop. Theoriginal version of the sequel isn't without its problems either.Its a great shame as its a highly underated game that's well worth a play through. It crashes, randomly and a lot. Save often and persevere if you have the patience would be my advice.